To all who have helped us pursue God's vision for Grace Babies' Home this year: Thank You and Merry Christmas. In the past week the Lord has brought a few new workers to the Baby Home who have blessed me. Fellow YUGO missionaries, Tom Coles and Narcis Dragomir, have been lending their drywall finishing talents to Grace Babies’ Home. It is encouraging to see many from our YUGO family get behind this project not only with their words of encouragement but with their deeds as well. Praise – The septic tank is finished! We are now getting ready to install the leach fields and then we can cover the tank and run water and electricity conduits from the street to the home. Pray - Pray for God to continue blessing the project with resources and workers. Pray for the land behind the Baby Home; we have a desire to one day see that land added to the home in His timing and in His way. Continue to pray for protection over the home and everyone involved in this project. Share – Share this post and our prayer needs with all your friends on your social networks. Prayer changes things. When we decided to dig our own septic tank instead of using an existing one on the Children’s Home property, I knew that there was only one person I could trust with this project, Tio Jerry. Jerry and his wife Linda retired here from Nebraska where Jerry was a contractor. They serve faithfully at GCH in whatever capacity they can. The septic tank is nearly finished and will serve us for many years to come thanks be to God….and Jerry. We recently had a visit from a team from Neighborhood Bible Church in San Jose, CA. Carl, Jonathan, and Rob worked tirelessly hanging the remaining drywall in the front room of the second floor and in three bathrooms. One year ago, a team from Westgate Church was here to begin framing the Baby Home. This weekend they returned to help keep the project moving forward. The crew installed our sprinkler system downstairs and finished preparations for drywall installation. They installed the last of our insulation as well as staged some of the drywall in the rear of the building. After finishing the downstairs preparation work, they moved upstairs to help with hanging, taping and mudding some drywall. With the assistance of some helpers from Faith Bible Church in Temecula and after a few lessons from our dear friend Rody Johnson from Grace Chapel of Indio, the crew taped and mudded almost the entire front room of the second floor. What a blessing it was to have Rody there to get us trained and keep us from messing up. Praise - All of the sprinkler system components and materials have been safely delivered and about 75% of the system is installed. Pray - Pray for protection for the Baby Home. Our property was broken into last week and some items were stolen from our neighbor’s yard. Nothing has happened to the Baby Home itself. We believe it is prayer that keeps the building safe. Just a quick note to let all of you who have been praying know that our sprinkler system materials have arrived safely at our office in San Diego. They will be brought down to the Baby Home over the next few days. Things are progressing quickly with the drywall thanks to the amazing efforts of our last two teams. A group from Heritage Alliance Church in British Columbia arrived on Tuesday and continued the insulation, finished the stucco wire, re-wired our temporary power lines into the building and pre-wired all of our emergency lighting and signs. 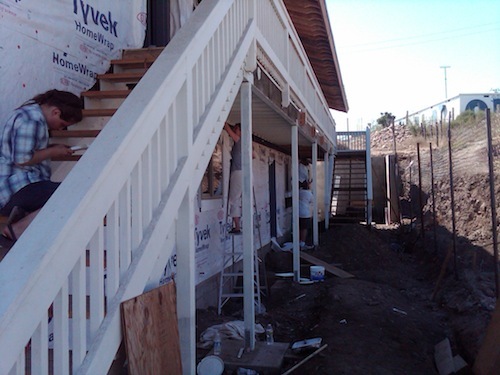 They primed and painted the stairways and prepared the entire second floor for the team from Grace Chapel of Indio. GCI finished hanging most of the upstairs drywall and taped and mudded about 75% of what was hung. The Lord has also sent a few local helpers; one of them is a drywall finisher by trade. God constantly reminds me that this is His project and He desires to see it finished more than I do. PRAY - Pray that God would fill our calendar in December and January with teams that have the right skills to keep the Baby Home project moving. PRAISE - Our sprinkler system is on order and should arrive next week. The design is complete and we will be ready to install once the materials arrive. SHARE - Use the share button to get the word out to those that would be willing to come and invest their time and talents toward God’s work here at Grace Babies’ Home. This past weekend marked a milestone in the progress of the Baby Home construction project. We have officially entered the drywall stage. The day after the successful delivery of our donated drywall, the team from Horizon Christian Fellowship began hanging sheets in three of the upstairs bedrooms. 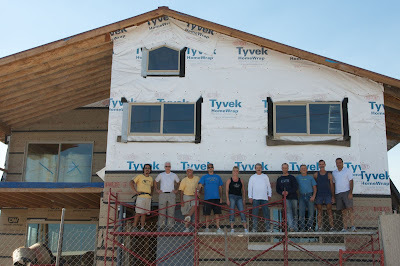 The rest of the team along with a few visitors from Calvary Chapel Santa Barbara worked on several other projects including the waterproofing of the second floor patio, insulation installation, stucco paper, stucco corners and the installation of some of the shower plumbing fixtures. Also, there were some minor last minute framing changes that were completed. PRAY - We have received part of the plans for the sprinkler system and the materials are on order. Please pray that we will be able get the sprinkler system installed in the places where we need to continue with drywall. SHARE - As the Baby Home approaches completion, we will need to raise up faithful committed partners who can support the ongoing operation of the Baby Home both in prayer and in giving. Will you share the ministry with three other people this week? Yesterday all of our donated drywall was delivered. This was a direct result of God’s heavy hand of grace upon us and the generosity of many. Temecula Valley Drywall donated all 290 sheets of drywall. Ramirez Trucking donated their services to haul the 6 pallets from Oceanside all the way to the Baby Home. Corporación Logística donated their services as customs brokers to clear the drywall thru the Mexican customs agency. Harper Corporation here in Tijuana donated a crane and crew to offload the 3000 lb pallets. Brothers in Christ from a local men’s rehab facility that our church supports came to load the sheets into the building. Lastly, our dear friend Jay Kawano and his company, FreshPac, were instrumental in coordinating the entire process. It is humbling to see the Lord show himself so strong on our behalf by putting a desire to help into the hearts of so many. Thank you to all who prayed so diligently for the safe delivery. 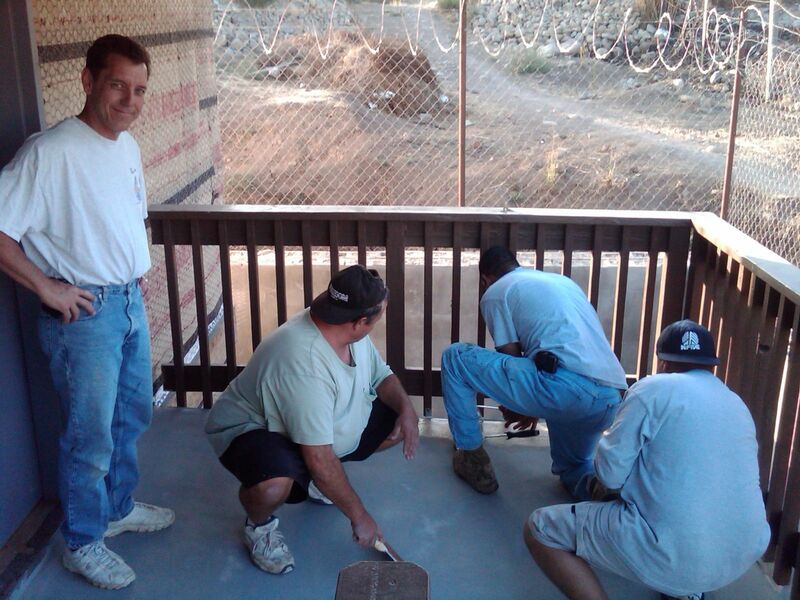 Grace Chapel of Indio made their first visit to GCH this past weekend to work on the Baby Home. They came to finish the stucco paper and start the installation of our donated insulation. The stucco paper is about 95% complete and the team was able to get about 80% of the insulation installed. Also, we finished the interior plumbing. Both the water and drain systems were tested and all leaks were fixed. We also have a couple of faithful brothers from our church who will be working every Tuesday at the Baby Home in an effort to keep things moving in between teams. This week we will begin on the septic system. PRAY - Pray for the arrival of our sprinkler system. The system design and materials are being donated however, we don’t have a firm delivery date. We cannot start the drywall installation until the sprinkler system is installed. SHARE - Be sure to pass this blog on to your family, friends and co-workers. You can click on the share button above to share the blog on your Facebook, Twitter and MySpace pages. We were blessed to get to know the MacIntosh families from British Columbia as they served this past week. Besides serving at the Children's Home, the two families continued putting primer on the Baby Home walkway and stairs. Along with fellow YUGO missionary, Ron Struska, they also helped load the remaining roof panels onto the roof. Both these tedious tasks were accomplished during last week's heat-wave. It was refreshing to see two brothers uniting their wives and children in service to our Lord. 1. We have started on the plumbing and find ourselves in need of plumbers who can work in a mixed environment of PEX pipe and copper pipe. Please pray for willing and able plumbers. 2. We are in the process of moving all of the drywall and insulation across the border. Please pray for the safe arrival of these products. 3. Most of the roof panels have yet to be installed. Please continue to pray for our roof guy, Chuck. Pray that God would open up his schedule to come finish the job. More importantly, pray that God would open Chuck's heart to the love of Jesus. This week we were blessed to have Vintage Faith Church of Santa Cruz serve at GCH. The team arrived Wednesday afternoon and spent the next three days bonding with the kids while tackling a variety of cleaning and maintenance projects. They also had a small crew working on the plumbing in the Baby Home. The drains are about 90% complete. 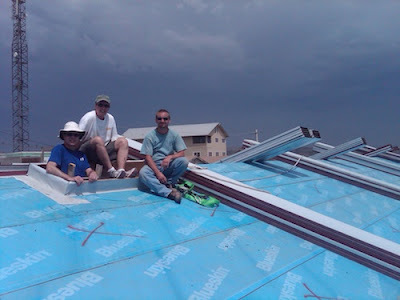 Part of the plumbing crew also helped load some more of the panels onto the roof before the drizzle (drizzle in July?) forced us off. No matter what was asked of them, this crew worked with total joy as unto the Lord. Elevation Church just completed their very first mission trip as a church body. They had a small construction crew working on the Baby Home and several teams doing activities with the kids. The windows are all in. The walkway railing is finished and primed. Exterior doors have begun to be installed. 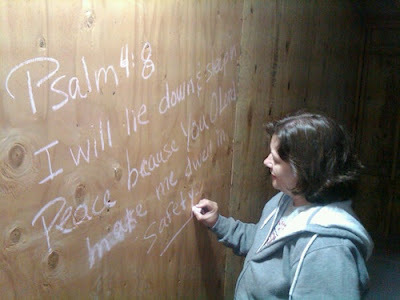 As their trip came to a close they wanted to bless the Baby Home through prayer and graffiti. Several team members walked through the home and wrote verses, blessings and encouraging words for future workers that will help finish the project. The roof installation has begun! Please pray that it would continue and that no one would be injured while working up there. Keep our roofing guy Chuck in your prayers. The Lord is not done with him yet. Pray for God to continue showing Himself strong on behalf of Grace Babies' Home. Saturday we finished up hosting the team from Grace Community Bible Church in Utah and hosted the monthly team from our sending church Horizon Christian Fellowship. All but 2 of the 35 windows were installed and we are close to having the building sealed up and secure. The Horizon team picked up right where the GCBC team left off and also painted the kid's play structure. The Horizon cooking crew brought and prepared an all-american lunch for the GCH kids and staff which included burgers, hot dogs, sausage, chicken, chili and of course, watermelon. Every day the baby home looks a little different as God continues to show himself strong on behalf of this project. As you can see from the photo, the roof which was delivered a week ago is not yet installed. Please pray for the roofing team led by a man named Chuck who in his heart, wants to see this task through to completion but has been going through some trials in his life. Pray that the roof will get installed but more importantly that through his involvement with the baby home, Chuck would have a personal encounter with God. "And it shall come to pass afterward that I will pour out My Spirit on all flesh; your sons and your daughters shall prophesy, your old men shall dream dreams, your young men shall see visions. And also on My menservants and on My maidservants I will pour out My Spirit in those days." Thanks to your prayers, the roof arrived safely. Thanks to both the trucking company and the customs broker who donated their services. Purchased the skylights today and finished framing the opening in the roof where they will be installed. 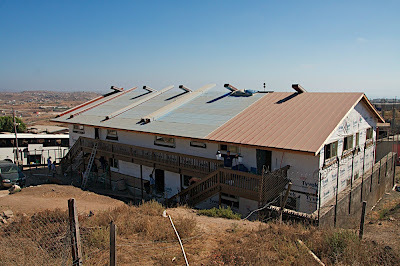 PRAY - Pray for the team from Progressive Roofing that will be coming to install the roof. Just a few quick updates on the baby home. 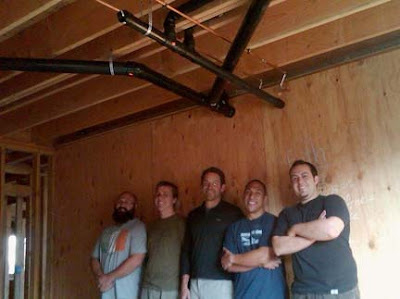 Many thanks to Jim, Franck, and Rob who came down from Encinitas and completed the last of our internal framing projects. They also began cutting back the rafter tails using a curved design that Rob came up with (see photo). This week is going to be an exciting one as we will be putting the roof on the building. PRAY - The logistics of getting the metal roof from the factory in LA into Mexico and delivered to the Baby Home in time for the crew that is coming to install it are difficult at best and impossible at worst. But with the Lord, all things are possible. Pray for His mighty hand of blessing over this process. Thanks to the hard work of four teams comprising of over 60 people over the last two weeks, work on the Baby Home has been progressing quickly. 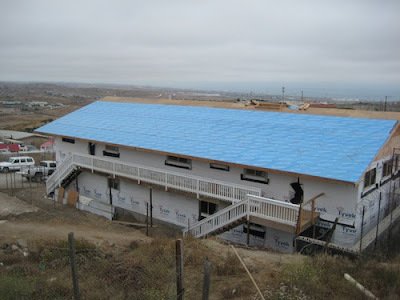 Westgate Church of San Jose and Santa Cruz Bible Church teamed up to tackle the final preparations for the roof. They also prepared the stairs and walkway project. The following weekend a team from Huntington Beach led by longtime YUGO friend, Denny Foster, worked along side a team from Horizon Christian Fellowship to continue the work on the stairs and walkway. They also finished all the necessary structural work, which involved heavy-duty anchors connecting the two floors together and connecting the building to the slab. It is wonderful to see so many different people who have never met working alongside one another toward one common goal: serving Jesus Christ. 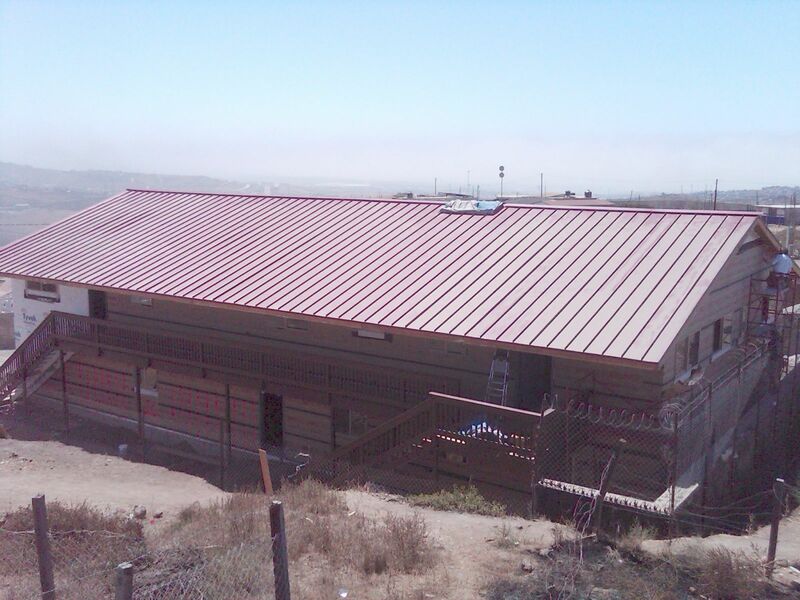 PRAY – We have plans to bring our metal roof as well as windows across the border next week. Pray for God’s favor as we navigate through the process of importing these materials into Mexico. GIVE – In future updates we will provide opportunities in this space for you to get involved with the ministry financially. As always you can give anytime using the “partner” button above.